Delicious seafood dish that is easy to prepare and ready in under 45 minutes. 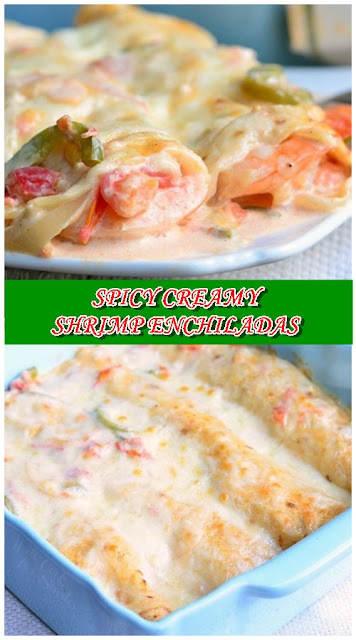 Cheesy seafood enchiladas packed with large shrimp, jalapenos, onions, tomatoes and all baked in spicy, creamy sauce. Preheat oven to 350 and grease a 9-inch baking dish. Preheat oil in a large cooking pan over medium heat. Slice onions and seeded jalapenos thinly and dice tomatoes. Saute veggies with some salt until softened. Whisk heavy cream, sour cream, pressed garlic, spices and salt in a mixing bowl and add it to the pan with veggies. Stir well.